Treadmills are a great way to work out in the comfort of your own house. They insulate you from bad weather and provide a more controllable workout. For those looking to purchase a treadmill, there are many different models to choose from depending on the amount of money you want to invest. 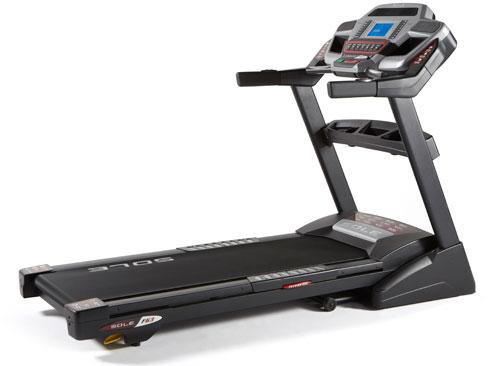 This Sole F63 Treadmill review will take a look at the device many believe to be the best value in its price range. The Sole F63 Treadmill comes out of the box weighing 253 pounds. Its footprint is 83 inches long by 33 inches in width. The total height is 58 inches. The running surface itself is an adequate 60 inches long by 20 inches in width. It is a high quality device that features a precision welded frame. Overall, the device supports weights up to 325 pounds. The walking platform and motor are the most high quality in the price range. The large diameter motor provides three horsepower of power and features balanced flywheels which tend to smooth the running surface for the user. The rollers are 2.75 inches in diameter and have incorporated grounding wires to reduce static electric shock from friction. The belt is well designed. It is covered by a nylon exterior surface on one side to prevent static electricity. The rest of the belt consists of two rubber layers enclosing a polyvinyl chloride interior. The former increases the durability of the belt while the latter prevents it from overstretching. The device is quite versatile. Its speed range goes from a very mild half mile per hour walk to a full 12 miles per hour high intensity run. For those wanting to simulate uphill gradients, the platform can be adjusted from flat to up to a 15% incline. The treadmill incorporates several safety features including a big stop button to cease the device in case of an emergency. All of these settings are fully adjustable on an elegant display console. The large 6.5 inch liquid crystal display clearly shows the current speed of motion, incline grade, estimated calories burned, and heart rate if the runner is wearing a monitor. There is even a message center that can be used to send you notifications throughout your workout and help you review your workout after you are finished. There is even a quarter mile track display mode to help runners train for competitive events. Controls are available on the sides of the display so incline and speed settings can be adjusted quickly while on the move. There are a total of six preset workouts of varying intensities. The user can also create his or her own custom workouts using two extra data banks. There are also two heart rate control programs available. One of the great things about the Sole F63 treadmill is that you do not need a ton of space to make use of it. When not in use, it can simply be folded upward so as to keep the floor uncluttered with equipment you do not need when not using it. The device’s Safety Lock Deck feature locks in it place so you do not need to worry about it falling down and potentially hitting one of your toddlers in the head. It is also very easy to unfold. You simply unlock the deck, and it will slowly fold down on its own. The thoughtful features that distinguish this model do not stop there. The Sole F63 Treadmill has built in speakers for you to play motivating music while on your run. Simply hook up your portable MP3 player and you are good to go. The coolest features, literally and figuratively, are the cooling fans that can help you beat the heat while in the middle of exercising. The Sole F63 comes with a full three year warranty on all parts. Labor is covered through one year. The frame and motor come with a full lifetime warranty. For those looking for a high quality treadmill that will not break the budget, the Sole F63 Treadmill is a great choice. Consider it an investment in your health and well being that will pay dividends for years to come.